This article was taken from our September 2016 newsletter. For the full newsletter and to subscribe, click here. The civil wars and instability in Jordan’s immediate neighbours of Syria and Iraq provide an extremely challenging backdrop to tomorrow’s elections in Jordan. Jordan hosts the second highest number (87) of refugees per 1,000 inhabitants in the world – the extraordinary generosity has resulted in immense pressure on the country’s natural resources and economy. The civil wars and instability in Jordan’s immediate neighbours of Syria and Iraq provide an extremely challenging backdrop to tomorrow’s elections in Jordan. The extraordinary generosity of the Jordanian people in hosting what the country estimates to be well over a million refugees – who now make up around 26 percent of the population, which is the equivalent of the UK absorbing the entire population of the Netherlands – has resulted in immense pressure on the country’s natural resources and economy. The elections will be fought under a new electoral system, based on open lists, and they will also be the first elections since the introduction of new legislation on political parties. Both of these innovations are very much part of His Majesty King Abdullah the Second’s vision for political reform in Jordan – of a move away from tribal based voting towards a more ideologically based party political system and eventually towards parliamentary democracy. Global Partners Governance’s political workshop at the Dead Sea in mid-August provided an opportunity for Jordanian political parties to focus on the practical realities of their respective election campaigns. Organised in conjunction with the Jordanian Ministry of Political and Parliamentary Affairs (MOPPA), Minister H.E. Eng. Musa AlMaaytah opened the event with a keynote speech, emphasising the critical role of political parties and elections in realising the goal of a parliamentary democracy. The conference sessions were attended by around 100 representatives from across the political spectrum, and focused on some of the key political and organisational challenges facing the political parties, including the role of candidates, manifesto development and drafting, voter contact, handling the media, and election-day planning. As with all GPG events, the intention is to support our partners to find ways of strengthening political representation by helping them manage practical problems. The second day of the conference took this further through one-on-one advice surgeries for politicians and candidates, where we drew on the extensive experience of us Associates. Our team has been working in Jordan for several years now and includes former Ministers, former senior Party staff and current and former parliamentarians. We aim to share knowledge of what worked and what didn’t work during our own election campaigns. However, that expertise and experience does not mean that we are telling them what to do. GPG’s approach is characterised by helping partners to find their own solutions. By offering support to all political parties and providing a framework of advice through the Ministry (MOPPA) our approach is quite different from other organisations – we provide support on the process and key issues involved in manifesto drafting, but never advise on the actual content of the manifesto itself. In other words, we offer practical advice to help the parties to help themselves. parliamentary democracy is a journey and not a finite destination – we are all finding our own route on that journey, constantly trying to improve things along the way. Changing a political culture takes time, but the evidence of active campaigning and the posters lining the streets of Amman during our last visit in September means, I hope, that these elections will mark the next positive step in Jordan’s journey towards an effective parliamentary democracy. This article was written for Global Partners Governance by Baroness Alison Suttie. 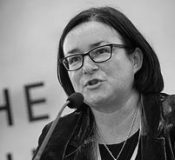 Baroness Suttie is a Liberal Democrat member of the House of Lords. She has worked as an Associate with GPG’s Jordan team for the last 18 months, providing support to political parties and blocs.